Remember that slogan from the 1990s? 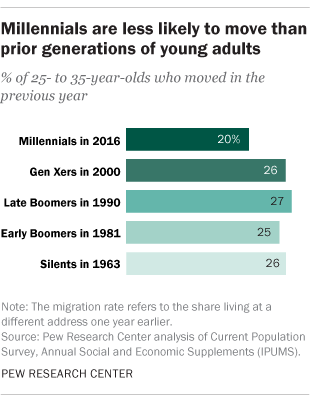 Well here in the 2016s, maybe it isn't--at least not when it comes to our grown kids moving back home after college. A May 24 story on the Pew Foundation's website trumpeted this headline: For the First Time in Modern Era, Living With Parents Edges Out Other Living Arrangements for 18- to 34-Year-Olds. The broad survey finding: In 2014, for the first time in more than 130 years, adults ages 18 to 34 were slightly more likely to be living in their parents’ home than they were to be living with a spouse or partner in their own household. Census data backs up Pew findings. In 1960, less than one in six 25-year-olds still lived with mom and dad; in 2014, nearly one in three did. What holds true for the U.S. is also a global phenomenon. Across much of the developed world, young adults are living at their parents’ homes for longer periods--either they never left or they're back after being on their own in college or the working world. What's going on here? Researchers say it isn't the difficulty in landing a career job or the burden of college debt (though those have some influence). Rather, it's a demographic and cultural shift. Kids are continuing to marry later, with this change. Or as Pew so delicately put it, there has been a "dramatic drop in the share of young Americans who are choosing to settle down romantically before age 35." The Pew headline needs close reading. It's not that a greater percentage of grown kids are living with mom and dad than ever before. That peak--35 percent--was hit in 1940. (Today it's 32 percent.) What's at an all-time high is the relative share of grown kids adopting non-traditional ways of living in early adulthood. Those living arrangement differ significantly by gender. Since 2009, the dominant living arrangement for young men has been living at home with mom and/or dad. Young women are edging close to that point but are still more likely to be living with a spouse or romantic partner (35%) than they are to be living with their parent(s) (29%). Meanwhile, 14% of young adults are heading up a household in which they live alone, are a single parent or live with one or more roommates, and 22% live in the home of another family member (such as a grandparent, in-law or sibling), a non-relative, or in group quarters (college dormitories fall into this category). • More young women (16%) than young men (13%) are heading up a household without a spouse or partner. This is mainly because women are more likely than men to be single parents living with their children. • In addition to the rising median age of first marriages (a decades-long trend), as many as one-in-four of today’s young adults may be eschewing marriage altogether. The overall share of young adults either married or living with an unmarried partner has substantially fallen since 1990. • Young adults in states in the South Atlantic, West South Central and Pacific areas of the U.S. have recently experienced the highest rates on record of living with parent(s). 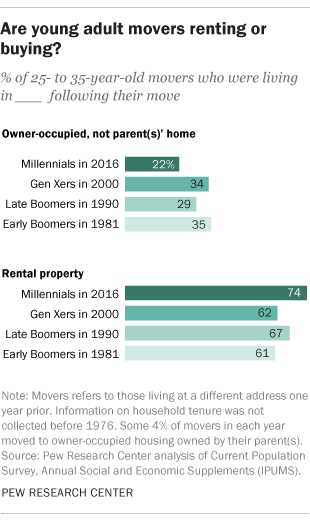 If you like charts and stats, here are some from Pew that spell out their findings on our millennials and their living arrangements. Parenting Millennials: How are they doing? See the stats on their work, school and love lives. Money Matters: Is it ever way-too-soon to set up a 529 for Grandkids? Some of us are early birds: We set up college savings accounts the minute a Grand is born. It's a gift of hope and trust in the future. Then there are those who are really early risers: We start paying into a 529 college-saving plan as soon as we hear a baby is on the way. It's a gift to celebrate the coming event and a bridge to the future. That's not all. There's an even more premature 529: the pre-grandparent account. A recent story in the Wall Street Journal took a look at starting a college-savings plan before the grandbaby has been conceived and conceivably before the recently wed couple are sure they want to have children. "If that seems like rushing" writes the WSJ, "think again." Here are the numbers behind the idea: The cost of the average four-year college is nearing $165,000 and rising 3.7% a year. A 529 plan started with the maximum $14,000 initial gift, five years before a child is born, funded with $500 every month and earning interest at 3% compounded monthly, would yield $226,784 by the child’s 18th birthday. The same plan started at birth would yield $167,336. When an infant arrives and receives his or her own Social Security number, the parents—or the grandparents who still own the account—can designate the newborn as the beneficiary. Ownership of the plan can be transferred to the grown children--the putative parents of the college student--should that be desirable or necessary. Or, if a future grandparent thinks he or she may not live to see a grandchild’s birth, a will can provide for an executor or trustee to carry out 529 plans using assets in a revocable trust. And if there is no Grand baby? That's part of the chance you take. Should I Start a 529 Plan? They worry about their financial future. Their average age is 30, but saving for retirement also looms large among their fiscal worries. And who do our Millennial-aged grown children trust to provide them with information about these financial issues? Us. Thus spake a recent Fidelity Investments’ Millennial Money Study. While they say--72% of them anyway--that they have no problem broaching financial issues with us, most of them --67%--have not had detailed conversations with us about such important issues as estate planning, health and eldercare, and covering living expenses in retirement. As to what we might be leaving them when we pass on, 41% say they have not had any conversations at all with us about our will and estate planning. The survey is a follow-up to Fidelity's 2014 Intra-Family Generational Finance study, which was an online poll of U.S. parents and their adult children that looked at the levels of agreement between families on key financial topics. To be part of the survey, parents had to be at least 55 years of age, have an adult child older than 30 and have investable assets of at least $100,000. Children qualified if they were at least 30 years of age, had at least $10,000 in savings. The newer survey asks many of the same financial questions to and about Millennials. The Millennials in this study average 30 years of age. Just under half of them are married, have children as well as a 401 (k) style savings plan. As to their parents, one-third of us are retired. They may trust us but 27% tell us nothing when it comes to money. The top three financial issues Millennials say they are tryingn to deal with include: accumulate more savings for retirement (52%), pay off credit card debt (41%), and pay off student loans (28%). Two-thirds think it is more acceptable now for children to move back home after college, and 32% say they are more financially dependent on their parents than their parents were at the same age. Nearly one-half of Millennials have received some kind of financial assistance from their parents at some point since leaving home. Topping the assistance list are cell phone bills, car insurance and groceries. The Millennials: A Generation Of Savers? Our generation may be "overinvested in our children." That's the reason financial planner (and consumer advocate), Eleanor Blayney, gives as why some of us have let ourselves slip into debt--despite carefully saving for retirement. There is, of course, the job market problem--an issue for those coming out of college in the past few years. Now that they are grads, we may help them with rent, put them up rent free at our place and otherwise offer a helping hand until they find their footing. It can become a problem when the costs go beyond our vacation funds and tap into out retirement kitty. But the issue is wider than that. Even their older brothers and sisters who entered the job market at a more generous time are struggling with financial disadvantages. According to a March study from the Urban Institute, they have considerably less wealth than we did at the same stage of life: They bought homes at the height of the bubble--the market's peak--and are now stuck dealing with the decline in home prices; they also put less money down (unless we helped with that 'little' investment), making it more likely that they have negative home equity. The UI study also reports that younger workers have tended to marry at a lower rate, have lower incomes than their parents, pay much higher costs for health insurance, and are more likely to be carrying college debt. No wonder many of us rush to "invest" in them, to try and even out the balance and keep them heading in the direction of a lifestyle that al least nears the equal of ours. If that sounds frivolous--or keep-up-with-the-Joneses--it is nonetheless at the heart of a worry many of us have. A friend remembers her daughter's post-graduate apartment in a run-down (low-rent) section of a city in California. It was in a dreary neighborhood in a one-room apartment that had hooks on a wall for a closet, an entryway covered with planks (to keep you from falling into a hole) and space for little more than a bed and night table that doubled as the table where she ate her meals. "It made me want to weep," my friend tells me. "How could her father and I live in such comparative luxury and let our child live in such reduced conditions. I wanted to write her a check right then and there and demand she find a better place to live." Most of us resist (as did my friend) and let our kids build character and work their way through the "tough" times. That is, we do that unless we feel the safety of our child is compromised. And then we invest, whether we have to tap our 401k account or not. It is one thing to say--as friends without children do--that children should stand on their own two feet, that we do them no favor by sheltering them from reality. No one helped them out when they were our kids' age. And yet, times have changed. the burdens are blurred--and heavy. We don't want to spoil them--whatever that means--or enable destructive habits. And that remains a basic tenet in whether or not to help support a grown child. But beyond that, for many of us, the investment seems both necessary and worthwhile. Emerging Adults: When is it time to cut the cord on financial support?